The Bariatric Center is tailored to fit your needs. Our goal is to provide you with the safest and most effective solution possible to address your weight problem. We are a center of excellence with committed resources and personnel dedicated to providing high-quality care to our patients. The Bariatric Center is a team of health care providers committed to helping you achieve your weight loss goals. Our center provides a comprehensive weight loss program, all under one roof. The Bariatric Center and Obesity Program is an American Society for Metabolic and Bariatric Surgery (ASMBS) Center of Excellence. 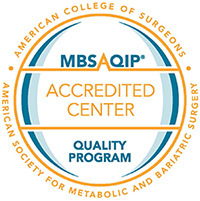 The ASMBS Center of Excellence designation recognizes surgical programs with a demonstrated track record of favorable outcomes in bariatric surgery. The Bariatric Center is a comprehensive obesity and weight loss program. The program meets the criteria established by the Blue Cross and Blue Shield Association for participation in the Blue Centers for Bariatric Surgery and is a member of the HealthPartners Bariatric Surgical Network. We offer the most reliable and effective surgical procedures available. Additionally, our doctors provide the full spectrum of obesity surgery services including revisional procedures, adolescent care, elderly care and a variety of other obesity related procedures. Information sessions are available for you to meet with members of our team, learn about bariatric surgery and understand the evaluation process. Bariatric surgery is a big step, and we want to make sure it is the right option for you and your personal situation. The long-term follow-up for bariatric surgery is an important factor in your weight-loss success. Learn more about how you can be successful. We know you have questions. Here are the answers to some of the most commonly asked questions from previous patients.